These are the words of the daughter of a mother with serious mental illness looking back on her childhood in Growing Up With a Schizophrenic Mother, by Margaret J. Brown and Doris Parker Roberts. I never thought about it quite this way before, but I’m a member of a select group: adult children of a mother with schizophrenia. There are more people who have a mother with schizophrenia than you might think – millions, in fact – because often schizophrenia doesn’t manifest until after a woman has children. But most of us believe we’re the only ones. No one else could possibly have had the bizarre, surreal childhoods we had. We believe this because we grew up in layers of isolation, self-imposed by ourselves and our families due to embarrassment, shame, and the illness itself, and imposed from the outside by others: extended family, our communities, and society. We were rarely asked about what was going on with us and our families, though in most cases it was obvious there was something wrong. People didn’t want to hear about mental illness because it scared them and made them uncomfortable. If we did try to confide in someone, which was rare, we were explicitly told not to talk about it or made to feel the topic was inappropriate. Often, the mentally ill parent wanted nothing to do with others and drove everyone away. I grew up in the 1950s, 60s, and 70s, when the stigma and silence surrounding mental illness were even more profound than it is today. Many of the adult children in the two books I’ve been reading are of my generation. 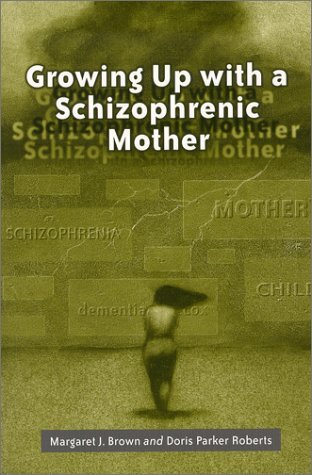 Growing Up With a Schizophrenic Mother, by Margaret J. 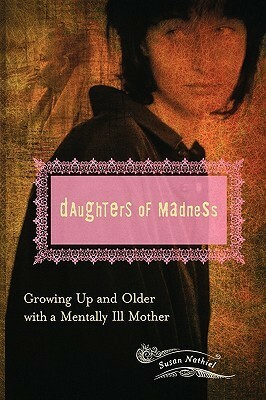 Brown and Doris Parker Roberts (2000), and Daughters of Madness: Growing Up and Older with a Mentally Ill Mother by Susan Nathiel (2007), contain excerpts from in-depth interviews with women and men who grew up with a seriously mentally ill mother. At the time they were researching their book, authors Brown and Roberts found little about the effects of mentally ill parents on children in the psychiatric literature, though that is changing. Margaret Brown and Susan Nathiel grew up with mothers who suffered from schizophrenia and, like many with similar backgrounds, both became therapists. Nathiel and her father weathered decades of her mother’s schizophrenia but never once spoke about it with each other until Nathiel was in her fifties. The authors concede these books may be skewed because they are the stories of high-functioning survivors, many who now have loving, stable families and successful careers as accountants, therapists, lawyers, and sales people. Those not so resilient are less likely to volunteer to speak about their pasts. Yet despite the measure of success achieved by the adult children in these books, in many cases the stories they tell can only be described as horror stories. The adult children themselves have an unshakeable, lifelong sense of loss and loneliness, and some do not even have a solid sense of their own selves. One little girl, Naomi, learned to follow other children to school when she and her mother moved to a new neighborhood, as they often did, and enroll herself because there was no one else to do it. Other children learned how to cash welfare checks, go to the grocery store for food, and negotiate with landlords. In the very worst of these stories, seriously mentally ill mothers tried to kill their children (by poisoning, turning on gas stove burners, parking on railroad tracks). Yet, in all of these instances, the children remained in the care of their mothers. These extreme cases are rare, and it’s important to remember this was the mental illness speaking and not the true volition of the mentally ill mothers themselves. Often, the parents divorced and the children lived alone with their ill mothers. In some cases, fathers tried to gain custody, but in decades past it was customary for mothers to have custody. In other cases, the fathers had serious psychological issues of their own or they chose to have little or no contact with the family. I was fortunate for a number of reasons: my parents stayed together, we were stable financially, and my mother was relatively high-functioning. Though she could be hostile, frightening, and unpredictable (my siblings and I were routinely left alone with her), she was never violent in the way some of the mentally ill mothers described here were, and there was no physical abuse. It was clear to extended family, friends, and neighbors that something was wrong with my mother, and if you were on the outside looking in I don’t see how you could be certain she wasn’t dangerous. (I found out years later my father discussed with his parents the possibility of us living with them.) Our family doctor, our minister, my aunts and uncles knew, but no one said anything to me about it. As an older teenager, I turned to my aunt for some help, but throughout my childhood and adolescence I remember only two adults who initiated conversations about my mother: my piano teacher and my grandmother. When I was ten or eleven, my teacher asked me if everything was alright at home. I was too embarrassed and too fearful of the consequences to confide in her, so I said everything was fine, though I know she didn’t believe me. I had always considered my maternal grandmother to be my best friend. We were very close, and sometimes she’d spend the night, which I loved. But one night when she was visiting, my mother had a severe psychotic episode. My grandmother was so frightened and upset she called a friend to come and get her. “I’m not staying another minute in this house,” she said. My father wasn’t home. It was past midnight when I stood at the living room window and watched my grandmother drive away. I didn’t know what I was supposed to do with that information; I was twelve. When I was 19, I began to try and find help for my mother. (She had never seen a psychiatrist. There was nothing wrong with her, it was the world that was crazy.) I made an appointment with a social worker at the hospital nearby, which had a new psychiatric wing. It was my first encounter with the mental health system and, for the life of me, I can’t fathom why the social worker seemed irritated I had even made the appointment in the first place. She asked me several times if my mother was going through menopause. I didn’t know much about menopause, but I thought my mother’s behavior was awfully extreme for menopause. Finally, based on the cursory information I told her, the social worker told me not to do anything, because nothing could help my mother. Ultimately, my mother was hospitalized for a time (that is another story), but no one else in our family was assessed or given counseling. In fact, I wasn’t told my mother’s diagnosis, and I felt I didn’t have the right to ask. I believe the mental health community was of little help to our family, and it failed my mother, too, in crucial ways. A couple of years later when I was living in New York, I saw a therapist who urged me to talk with my mother’s psychiatrist about her diagnosis. After some badgering, the very reluctant Dr. M – who said my mother had a right to privacy and confidentiality – finally granted me an appointment. I’m not exaggerating when I say he looked like Freud himself. Dr. M was intimidating and formal, without an ounce of warmth or ease. He finally begrudged me my mother’s diagnosis. As far as he could tell, he said, she had paranoid schizophrenia. This was in 1975. Today there are many compassionate and devoted mental health professionals, and there isn’t as much silence about mental illness as there used to be, but we have a long way to go. The mental health system is far from what it should be, and public stigma and denial are still pervasive. I’m sure there are children with seriously mentally ill parents living in situations similar to those I’ve described. The problem of mental illness can’t be borne and solved by the families alone. They need our help. I grew up with with 3 siblings , a father that worked and was gone and a mother that was mentally, totally gone. I was beat with everything she could fine, my skin was broken, I was forced to hide under the house with my brother from fear of being killed, forced to sleep outside in the barn and had cuts and bruises beyond belief. Told I’d we tell , she would kill us.. I would pray only to be pulled by my hair all over the floor and kicked and punched and said pray.. it will not help. Well, now , she is dying, … I am feeling such pain because this woman.. my mother never knew me. I grew into a mother that loves her children, grandma, and wife. I have made many mistakes but I have never beat my children. I just can’t get past this pain. I have found writing a memoir to be extremely difficult. While many say such writing heals, I am not so sure about that. Most helpful to me has been therapy, and my own wonderful family. We have a long way to go in terms of confronting and treating mental illness – thank you so much for commenting. I’ve been exploring your blog. I grew up with a father with bi-polar. Valium helped all our lives when it came out. Today I’m a mom with anxiety and depression–I wish my Dad had lived to have access to the much better meds we have today. So many families are affected by mental illness, and I wish we had better, more comprehensive services. We’ve still a long way to go. I feel the same way about my mother – wish she could have had better treatment. Being a student and one that hopes to become a health professional someday (not exactly a part of the mental health system though) this was really something I needed to read. Especially because, aside from the basics from Gen Pscyh, I have very little knowledge about schizophrenia. And I think you’ve convinced me to check out both of the works you mentioned. It was nice of you to mention that one of them have more skewed accounts just because most of the mothers were more high-functioning. You also mentioned that your mother was one also, but it’s amazing how well you and your family adjusted (though I imagine it was very difficult and confusing, since she didn’t have a real diagnosis until you were an adult yourself). Oh and this is a bit random but if you haven’t already, I’d recommend you taking a look at my friend Thomas’s blog. He and I are the same age but he’s been blogging much longer than I have (and had a post Freshly Pressed) and a lot of his posts reminds of this one you shared. He’s also a psychology major and reads a variety type of books, ones about mental illnesses included. You may like his blog. I was a medical librarian and loved working in health care, so I envy you that you are preparing and just starting out in a career! And thank you for the link to Thomas’s blog, I am following him now, too! Incredibly moving to read this post. A friend and I were just discussing our parents today – her mother was acutely narcissistic and mine was a compulsive liar. It was a relief to talk with someone who knows the pain and confusion but we’ll never be free of the lagacy. Thank you. I’m so glad you read this and commented. It helps when you meet someone who knows exactly what you’re talking about. I’m so glad you shared your story and these books. So much needless suffering because of a failed health care system, and the stigma against mental illness. You’ve poured light on a topic that too long has remained in darkness. I agree with another reader–you have an important story to tell about your childhood. Wow! These stories are absolutely amazing. It’s so important to get these stories told, because stigma still exists about these topics. I am interested in children’s literature and have been thinking about writing my MA thesis on representations of mental illness in children’s lit. What a way to erase stigma early on–by presenting characters as whole human beings. I hope you do that it is much needed. Thanks so much for your comment, Julie. Wow, Valorie, I think you’ve got a book in you, too. I remember how frightening it was for my sister and I to deal with our mother the years around our parents’ divorce – we had to grow up fast and were left alone for two weeks during high school while Mom went to the hospital mental ward. What we went through was nothing compared to the stories here! They are really eye-opening, and sad. That must have been really hard. I’m wondering if that is in your book or if you’ve written about it elsewhere. Yes, I’m trying with the book. Your own story is riveting indeed and you show an incredible amount of compassion yourself. It is so unfair to ignore the children in these difficult circumstances, but by there very experience it seems to often make them into incredible people themselves, to have coped with so much and survived and be able to build their own more stable lives. This also makes me think of the book I read recently ‘Brain on Fire’ and wonder how many have suffered from these kind of brain episodes and end up being diagnosed with schizophrenia, because we have insufficient knowledge about the cause and consequence. I,ve heard about Brain on Fire – thanks for mentioning, and thank you for the comments. I think a lot will be discovered about the brain in the next several years. Yes, it seems there is such a lot we don’t know. When the women in Brain on Fire was diagnosed, she was only the 200 and something’th person to have been so diagnosed and since she wrote an article and then a book about it, the numbers are now in the thousands and climbing fast. They are the lucky ones. It makes sense when we think about medical advancements, given the many thousands of years humans have been in existence, the knowledge we have about the body and the brain is relatively new and continually being improved upon. Great Post. You have endured some very scary episodes. You were a very brave child. I found your reviews so interesting. You might find Jenni Diski’s Skating to Antarctica interesting also – mental illness is a strong theme in the book. I wrote a little bit about it on my Librarium 2013 page. Thanks, Bridget. I will definitely take a look at your post and the book. What incredible stories, yours included!